I’m talking that exquisitely indulgent moment – the moment when you first melt into a sumptuous hotel bed. Transient, yes but oh-so memorable. Gently fragranced overstuffed pillows, fluffy robe, soft lighting – a home from home…only much, much better! The beautiful boutique hotel is no ordinary pied-à-terre. It represents pure, unadulterated luxury. 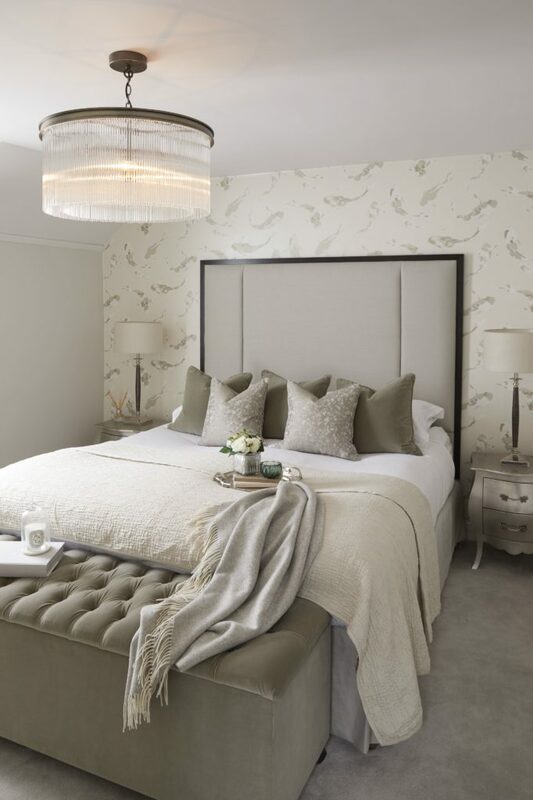 It’s no wonder that so many of us look to achieve the ’boutique hotel-style bedroom’ when renovating our homes. But what makes a master bedroom feel like a luxury hotel? 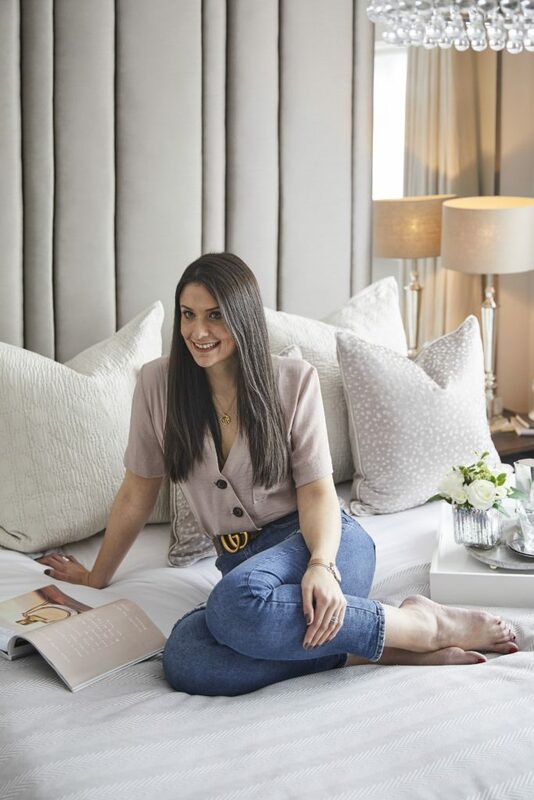 Tricky, where there’s a distinct lack of turn-down service and pillow-chocolates… This is a question I’m constantly exploring and was something I considered closely when redesigning my own master bedroom. 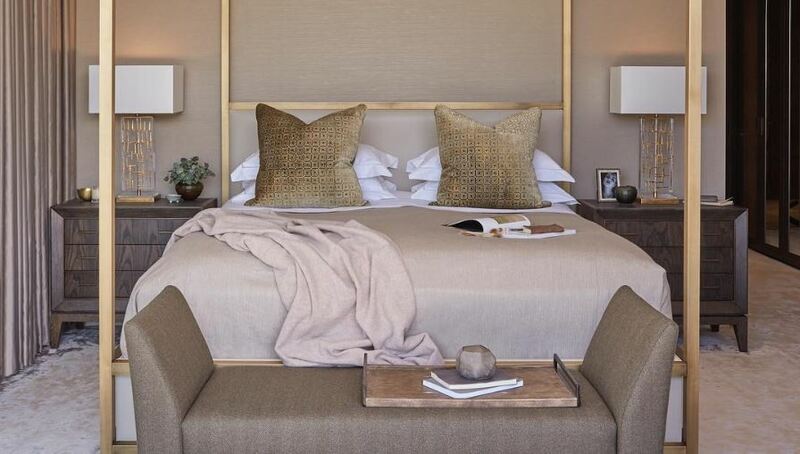 Packaged into 5 neat sections, I hope that this post will guide you to achieve a truly aspirational and luxurious boutique hotel-style bedroom of your own. I’ve said it before and I’ll say it again – colour is key. And I use the term loosely as it can also refer to ‘lack of’! For ideas on the latest colour trends in 2018, read my post here. A pivotal device for all rooms, colour can set the tone of your scheme, creating mood and atmosphere. The right hue can even induce sleep. For hotel-inspired luxury living, the palette requires a certain sophistication. Fuschia pink walls just don’t quite cut it. The overall colour-scheme should be considered holistically; from wall-coverings to wardrobe finishes, linens and flooring. 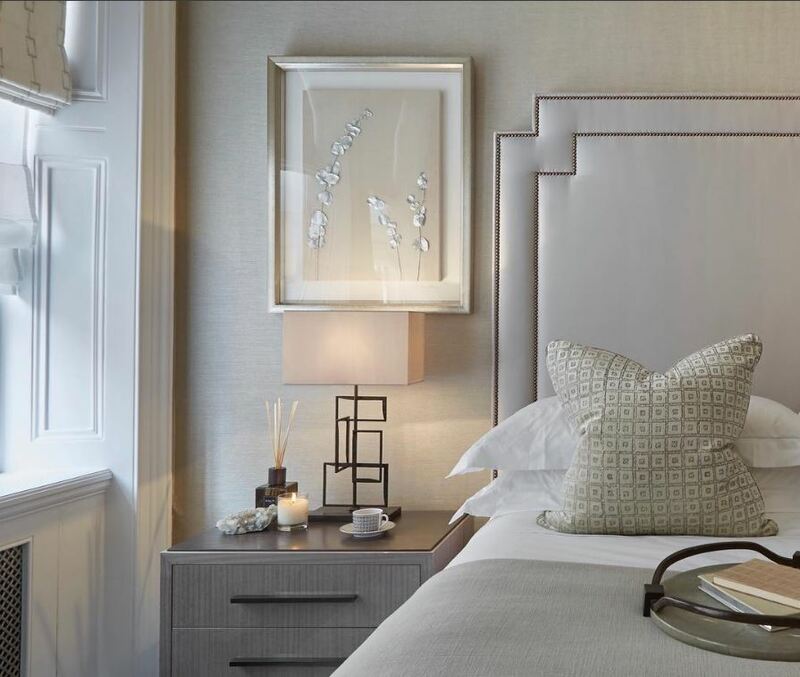 I generally opt for soft, easy-neutrals as the ‘foundation’ of a luxe hotel-inspired space. By this, I mean the larger, more permanent pieces – headboards, wardrobes or curtains. 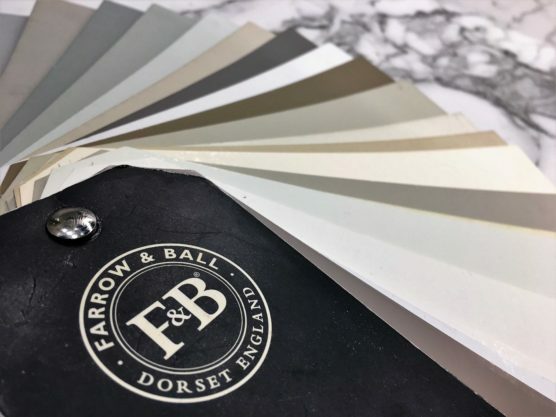 Choosing the perfect paint colour can be really tricky and you should consider various factors such as the orientation of your room (more advice on this here). My go-to colours range from chalky whites, greige, mushroom, stone and taupe to feather, green-greys, silver, soft champagne and golden hues. 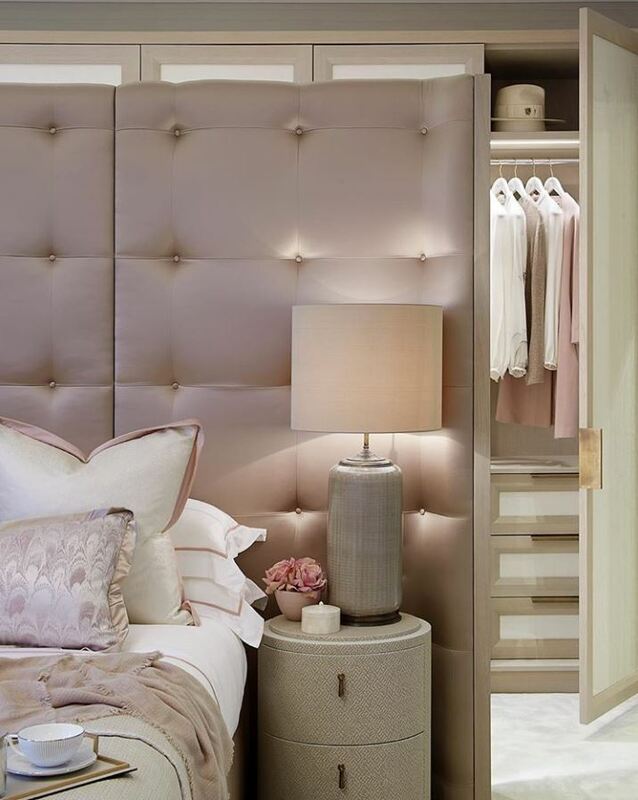 Dusky pinks and pale blush are also fabulous contemporary options for walls, linens and window treatments. Gentle blues with warmer undertones can also sing. For my own, north-facing master bedroom, Farrow and Ball’s classic Elephant’s Breath was the perfect solution. A contemporary neutral paint with warm, red/lilac undertones, this hue has beautiful depth and a soothing quality. For continuity – and to extend the feeling of space – the woodwork and radiator dutifully received a couple of coats too. 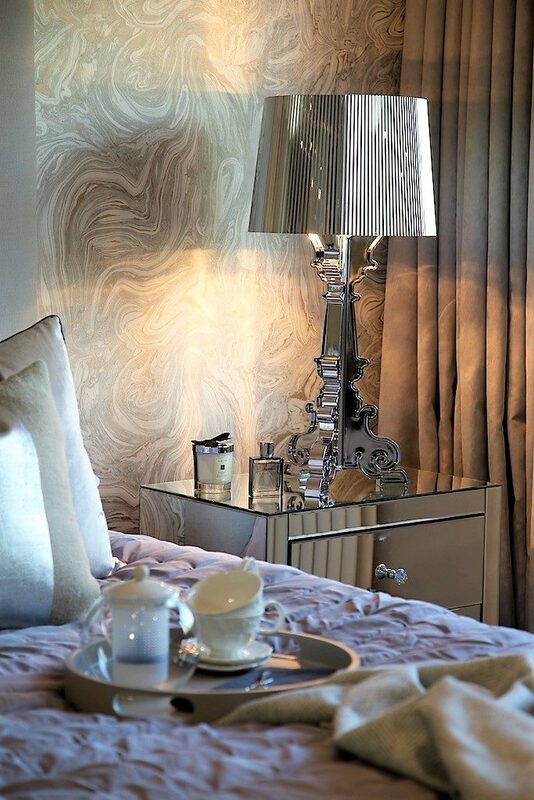 Wallcoverings are used extensively in luxury boutique hotels as they bring textural interest and depth to a space. 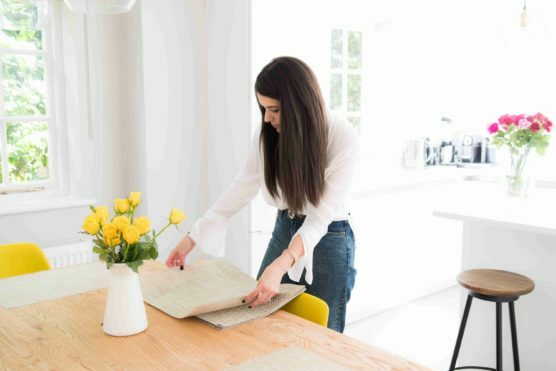 If you’re looking to work with wallpaper in your home, first and foremost, I recommend choosing something that you love. And don’t be afraid to hang everywhere, especially if a subtle grass-cloth or gently textured silk appeals. If paring with paint, allow the wallcovering to guide the colour. Whilst the heavily accented feature wall is pretty dated, use subtlety and flow as a contemporary way of combining wallpaper and paint. 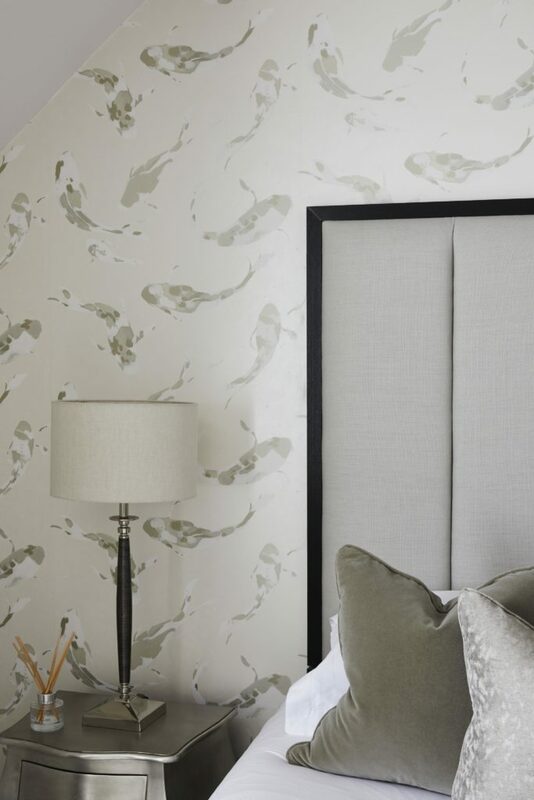 If you’re looking for on-trend wallpaper inspiration, this blog post is for you. Wallpaper selection is quite personal but I always find myself gravitating towards textural or gently curved patterns and subtle, loose prints. 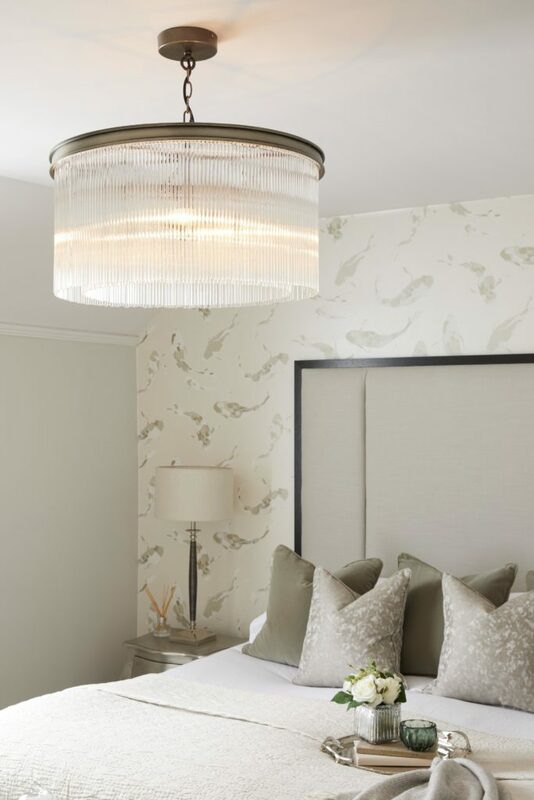 Even a floral works but I recommend softness for a hotel-inspired luxury master bedroom. Sophisticated serenity is the goal. Fashionable metallics and iridescent finishes can transform a palette. From rose-gold, copper and chrome to pewter, bronze and brass, a metallic pop can really sizzle. Mix and match with confidence (I’ve written more on this here). Brights can also be introduced through soft furnishings and accessories – essentially, inter-changable aspects that don’t require huge commitment. 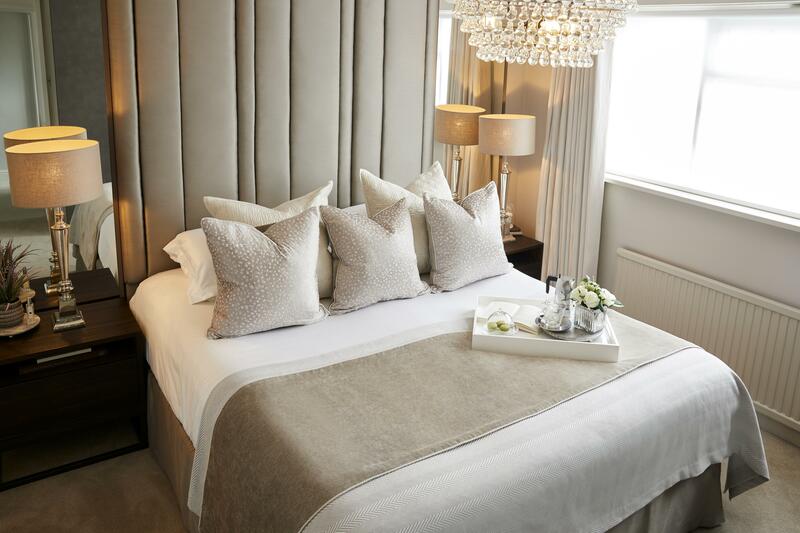 When designing a luxury master bedroom, the ‘colours’ that I generally select tend to be more ‘balmy’ than ‘bright’. 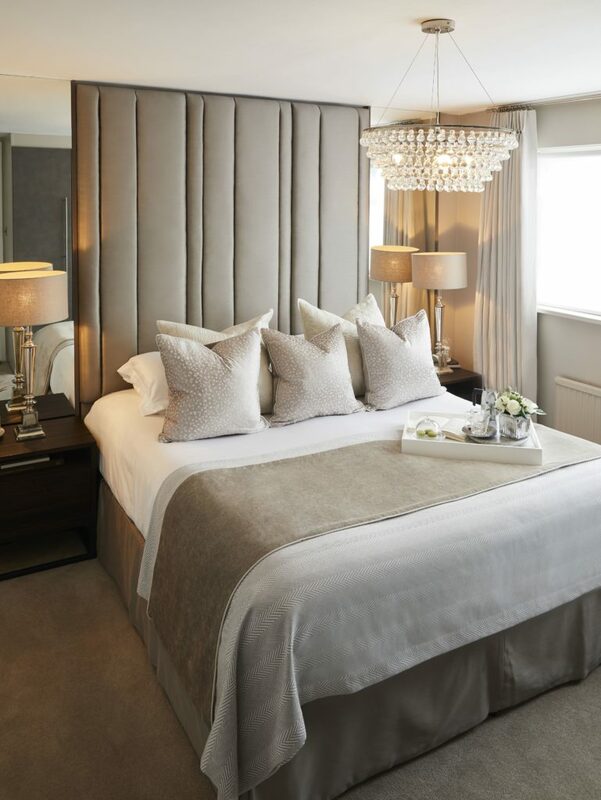 The bed (and headboard) should be the focal point of the luxury master bedroom scheme. Aim to position centrally in the space and work symmetrically around it if possible. One of the best pieces of advice that I can give is to go for the largest bed that the space can handle. My bedroom is really quite small but a good night’s sleep wins every time! After all, if you want to achieve total hotel luxury, comfort is paramount. For a mattress, I champion anything with a topper. Go for the best that you can afford – it’s a long-term,worthwhile investment after all. I would also suggest you always try before you buy to avoid costly mistakes. Whether you’re buying a new bed in its entirety or simply adding a separate headboard, consider how to achieve that ‘wow’ factor. Drama and unashamed opulence is certainly a key aspect of the luxury hotel and this can be achieved through scale. 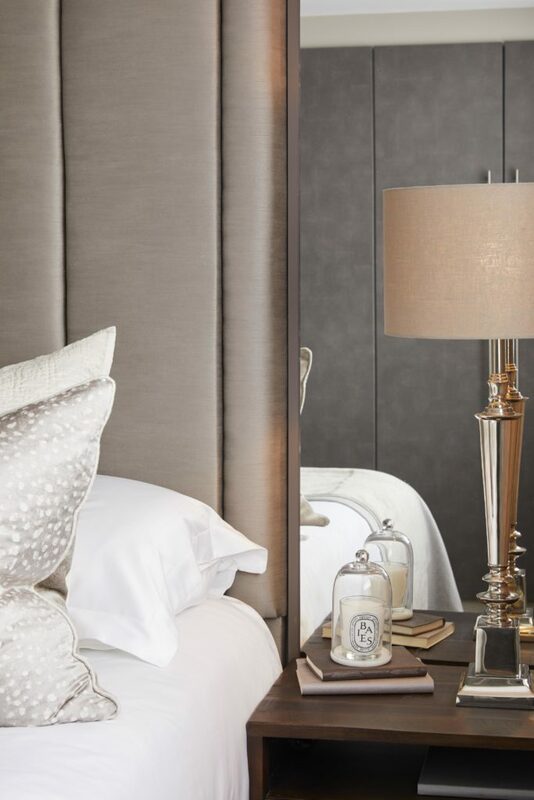 As my own master bedroom is so tiny, I designed a full height, vertically upholstered bespoke headboard which was wall-hung. This strong emphasis on verticality encourages a feeling of height and space (read more here in my interior design secrets post). It also offers a strong, statement backdrop for the layered cushions. We installed bespoke mirrors either side to add to the symmetry and drama! 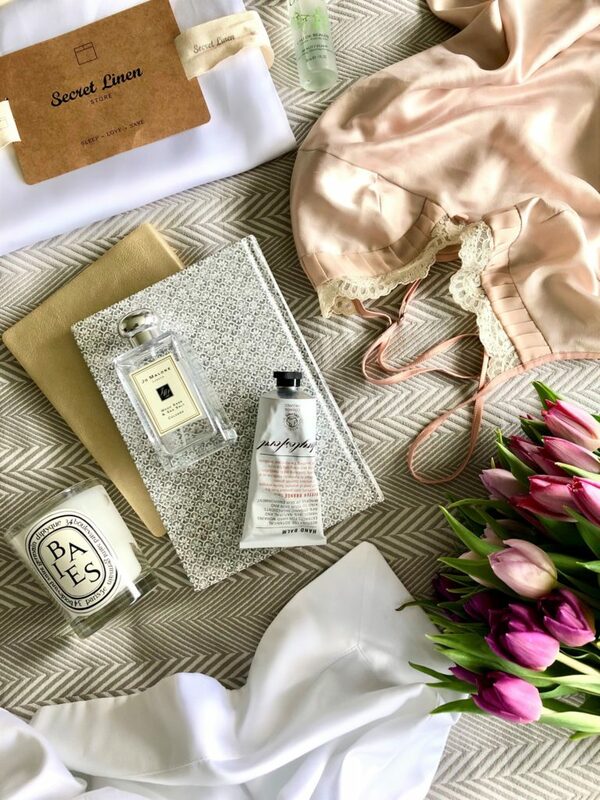 Dressing the bed – one of my favourite parts! Beautiful upholstery denotes classic luxury and elegance. Choose timeless fabrics like silk, satin, velvet or the more understated cotton-linen for the ultimate in hotel luxury living. 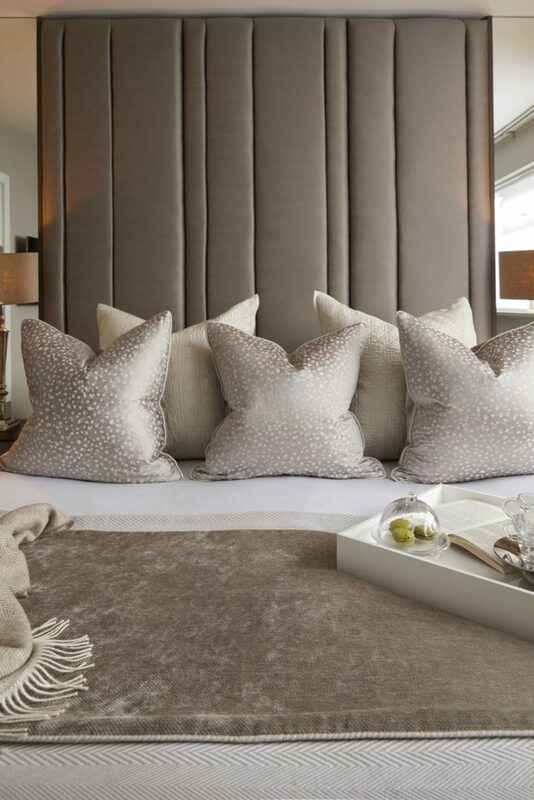 Deep buttoned styles, studding and sectioned headboards always appeal to me. 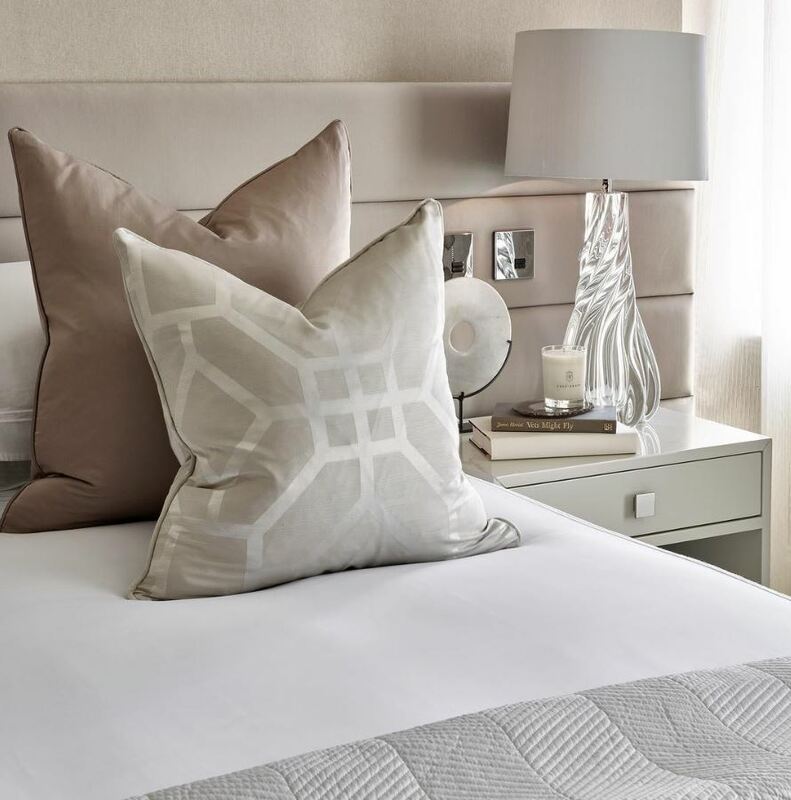 Sectional headboards are also perfect for spaces with limited access – small corridors or cramped staircases – so always consider this when planning your scheme. Toy with interesting shapes – curves or architectural motifs for a different take or explore the ultimate luxury – an upholstered wall. Meanwhile, a framed headboard offers the perfect opportunity to introduce dark wood or black for that all important contrast. I’m also a huge fan of low-level headboards which span across the back of the bed and beyond. These can really emphasize the feeling of horizontality within the space. Finish with some artwork above to fill the ‘void’. Cushions, artwork bedside lamps should work in proportion with the headboard. 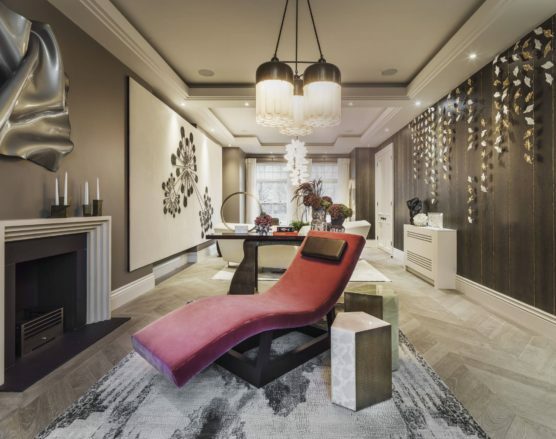 Nothing says ‘luxury boutique hotel’ more than a seating area within a bedroom scheme. If you’re lucky enough to have the space for some occasional chairs and a little table – go for it! At the very least, an end-of-bed upholstered bench or storage ottoman is #goals. My master bedroom has no such space and so I’m forced to live vicariously through my clients. A sofa or bath is clearly denotes next-level luxe. Wardrobes don’t have to be cumbersome. Ideally, they will be in-built (or at least appear to be with careful surrounds). Go for the maximum amount of storage that you can as this is everything. 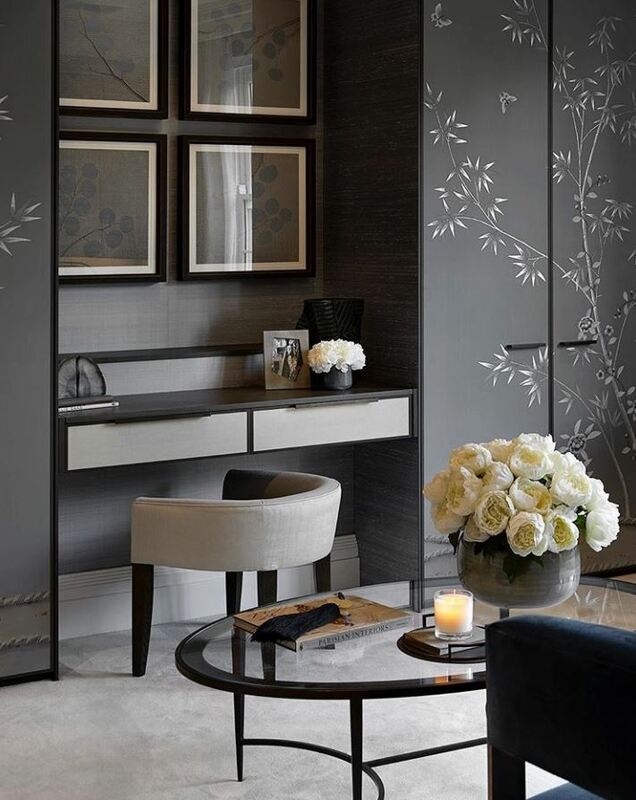 The luxury hotel bedroom certainly doesn’t ever feel cluttered and unmanageable, so the more secret spaces available for you to hide things away, the better. 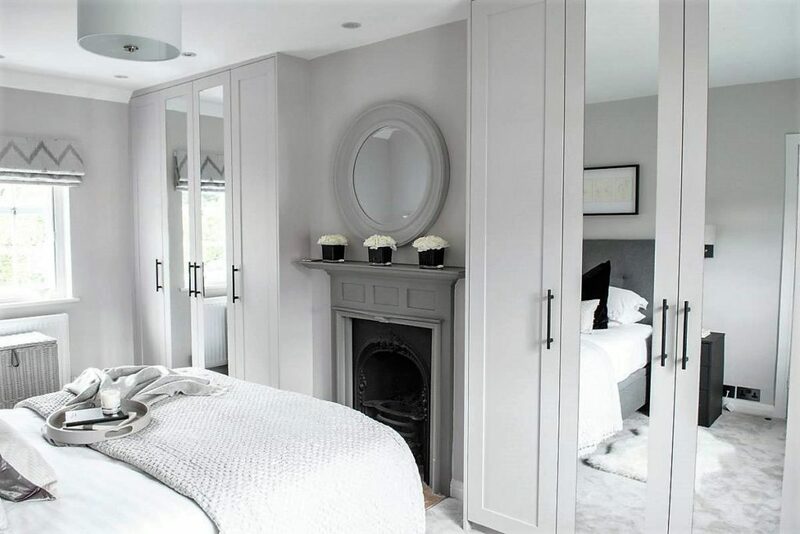 To avoid wardrobes looking bulky, consider painting them the same colour as the walls so that they simply ‘melt’ away. I also love to use wallpaper on wardrobe doors, whether within panelled recesses or wrapped-around. 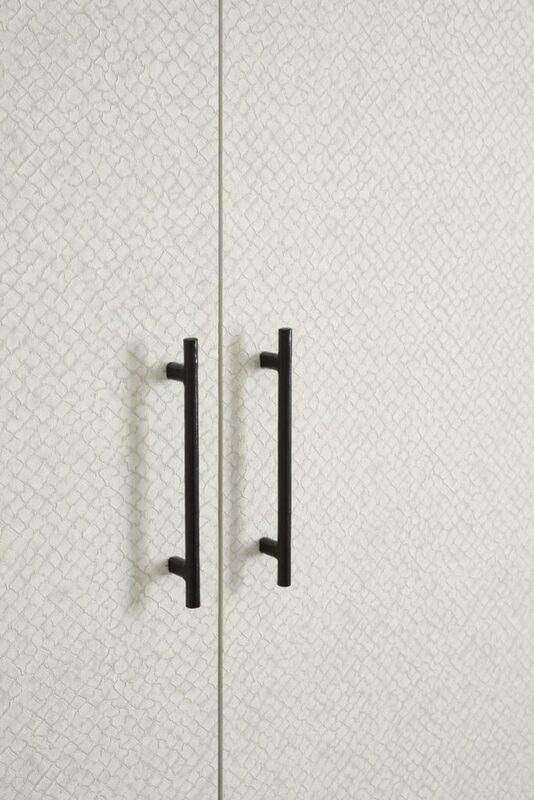 To avoid looking pastiche and for durability, go for beautiful textured vinyls or silk coverings. 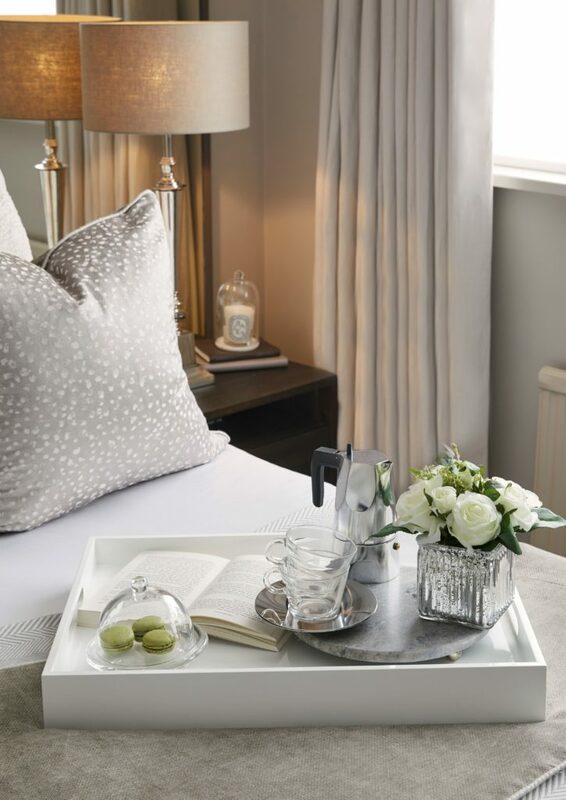 Bedside tables don’t have to come as a matching pair, although I love it when they do! And so does the luxury boutique hotel. (We’re suckers for symmetry). Aim to keep them lower than your mattress and proportionate to your bed (so aim for wider if you have a Super-King like me). Of course, this isn’t always possible but certainly something to bear in mind, should space allow. Remember that dark colours can feel weighty and so these work well either side a large bed and oversized headboard. Also, dark wood like wenge or walnut is beautifully timeless. I make my bed every day and I cannot recommend it enough. I maintain that it’s good for the soul! Arriving home to an unmade bed can be stressful and doesn’t set a restful tone for your evening ahead. Consider the linen as your bed’s foundation. 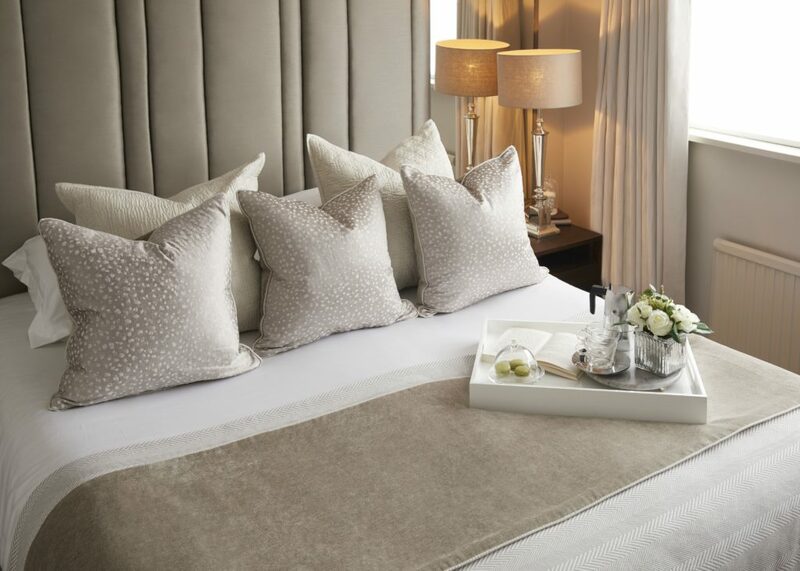 Finish ‘dressing’ it with a large textural bedspread or throw, a soft blanket and some beautiful cushions. 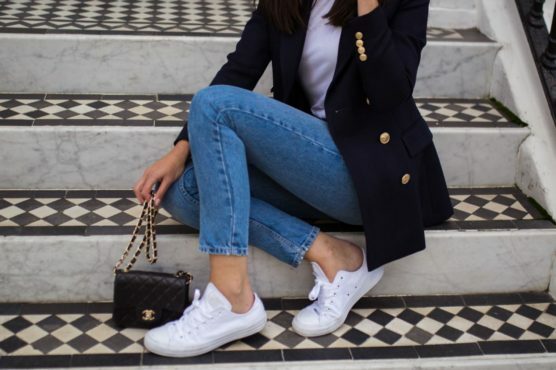 Layering is key. 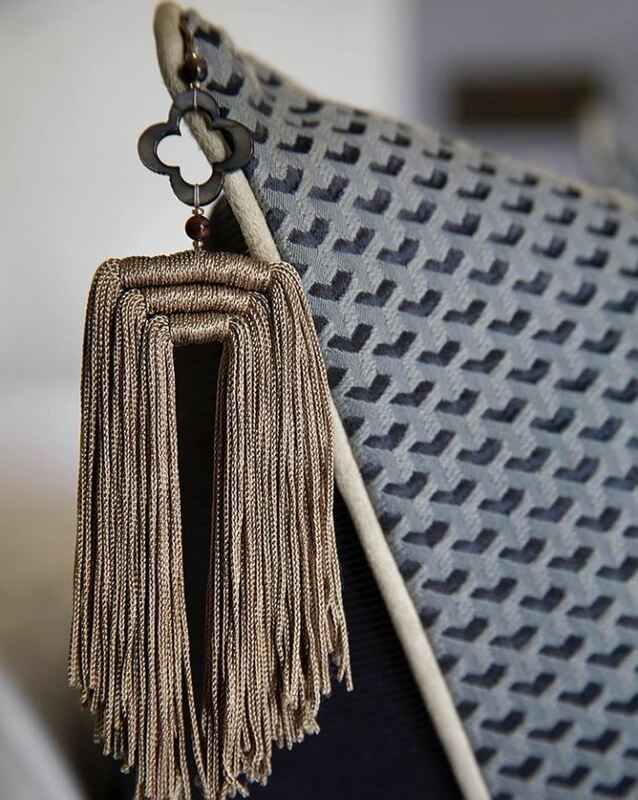 Mix patterns, textures and finishes – from herringbone weaves to mohair knits or quilted cushions. Stick to feather-filled stuffing for cushion karate-chop perfection. And for unashamed luxury, go velvet. Trims can be a beautiful finishing feature and I’m always an advocate of a piped-edge. You can have a little play with colour here (I have been known to throw in a mustard, gold or olive green)! Explore scale too – using larger cushions as a backdrop for smaller accents in the foreground. For some gorgeous cushion ideas, click here for my need-to-know one stop shop. Windows vary greatly in their style, size, depth and finish. For my unsightly UPVC run (sigh), I opted for a semi-sheer blind in a soft white, which allows natural light to diffuse into the space. This creates a universally flattering effect and effectively hides the plastic frame. A simple trick that I can’t recommend enough, semi-sheer roller blinds are inexpensive and also aid climate control. Alternatively, you could install sheer voils to similar effect. For a streamlined and luxurious look in the bedroom, I’m a huge advocate for floor to ceiling interlined and blackout curtains. Hang them high to visually elevate your ceiling height, adding grandeur and glamour to the space. When a significant run of fabric is being used, I generally opt for a plain or lightly patterned finish rather than anything too heavy or brash. Less is more, after all. Install little reading lights either side for practicality and consider a low-level glow through LED strip lighting under the bedside tables. This also works behind the headboard, creating a soft wash across the walls. Keep those ceiling spotlights turned off. 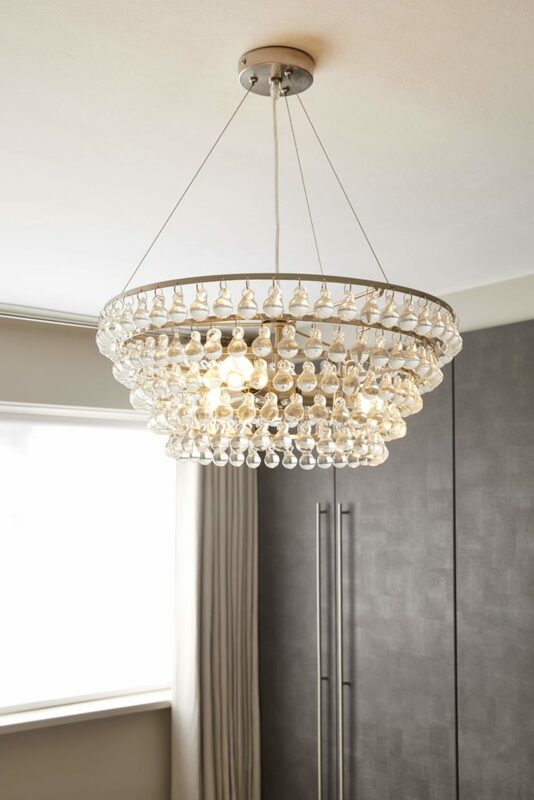 Instead, a statement pendant or chandelier – always on a dimmer – completes the look and can add real ‘wow’ factor. For a flattering evening glow, candles are your friends. Use generously. 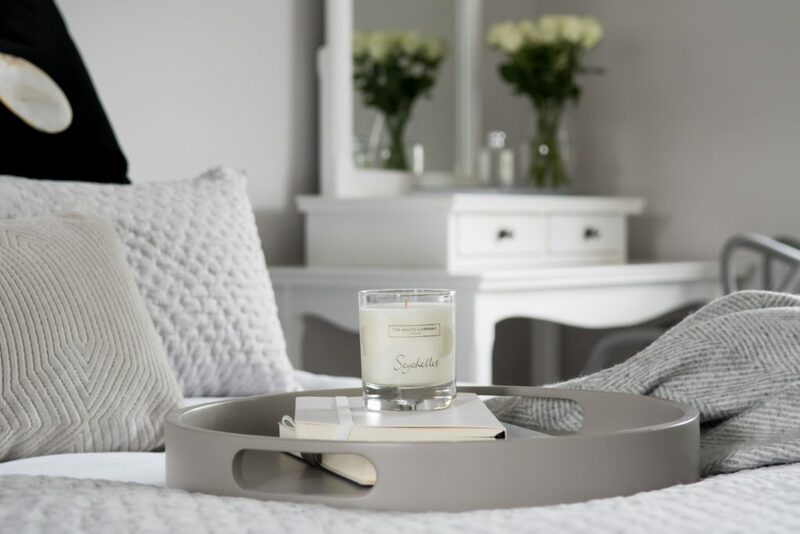 Essentially jewellery for the bedroom, curate select pieces on your surfaces to give it some ‘sparkle’. It’s important to appeal to all senses in the accessories you choose. Feel dreamy with a luxury scented candle burning early-evening (an edit of my all-time-favourites will be appearing on Girl About House very soon). Pretty perfume bottles also work effectively as a styling tool, whilst pillow sprays look lovely and can induce sleep too – win/win. I like to display these on the bedside table, space dependent. 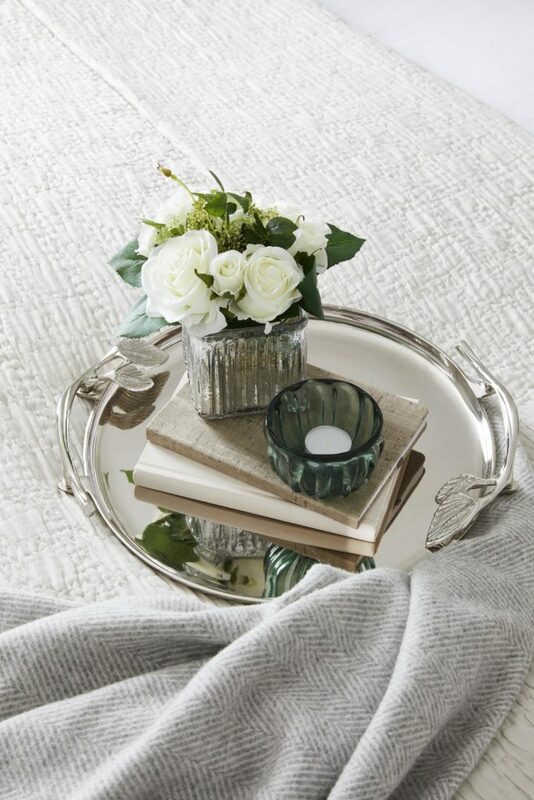 Add textural variation with extra blankets or rugs, which are especially welcomed when the temperature drops. Plants or flowers also inject visual interest – go faux if you’re looking for minimal upkeep. They can also be used to introduce a pop of colour and more organic shapes into the scheme. When planning how to dress your walls, a big question mark hangs in the air. Should you forgo the TV? The big TV debate aside, embellish your walls with beautiful mirrors and treasured artwork. 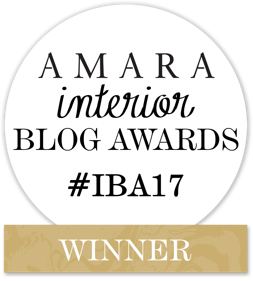 I used mirrors either side of my bed to enlarge the space – a trick many miniature boutique hotels also adopt. Eglomisé, foxed and other antiqued finishes are softer on the eye and more flattering. Artwork can be used to add focal point to empty wall space – from pretty watercolours and understated line-drawings to layered prints. AND FINALLY – BREAKFAST IN BED? If you’re unwilling to commit to a chocolate on the pillow every night, consider investing in a large, coordinating breakfast tray. Perfect to use on those casual, breakfast-in-bed mornings. Those days when you have nowhere else to be (said no mum, ever)! Ideally, assign someone else to make the pancakes and finish with an extra helping of maple syrup! All you really need is a breakfast-in-bed tray. I’d love to hear your thoughts on my luxury boutique hotel-style bedroom scheme and about your own design updates. For some inspiration and glamour, take a look at my posts on The Ned, London, The Ned Part 2 and The Langham hotel. Comment below or continue the conversation on Instagram. Enjoying some well-deserved ‘me time’ after completing this mega blog post! Very attractive content to read with an eye catching image. Great ideas on designing a luxury hotel style bedroom. Hi I wondered if you supplied oor knew where I would get the cushion tassels from the picture above? Thanks! Wow!!!! it’s the amazing interior of rooms, I love it. 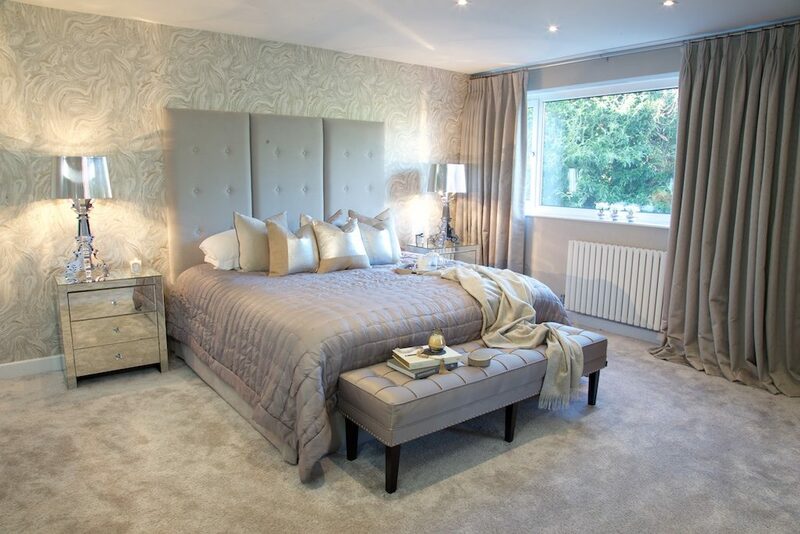 I like the bed (and headboard) should be the focal point of the luxury master bedroom scheme.